The National Academy of Sciences is the U.S. adhering body of the International Union of Pure and Applied Chemistry (IUPAC) and it maintains its relationship with the union through the U.S. National Committee (USNC)/IUPAC. IUPAC serves to advance the worldwide aspects of the chemical sciences and to contribute to the application of chemistry in the service of humankind. 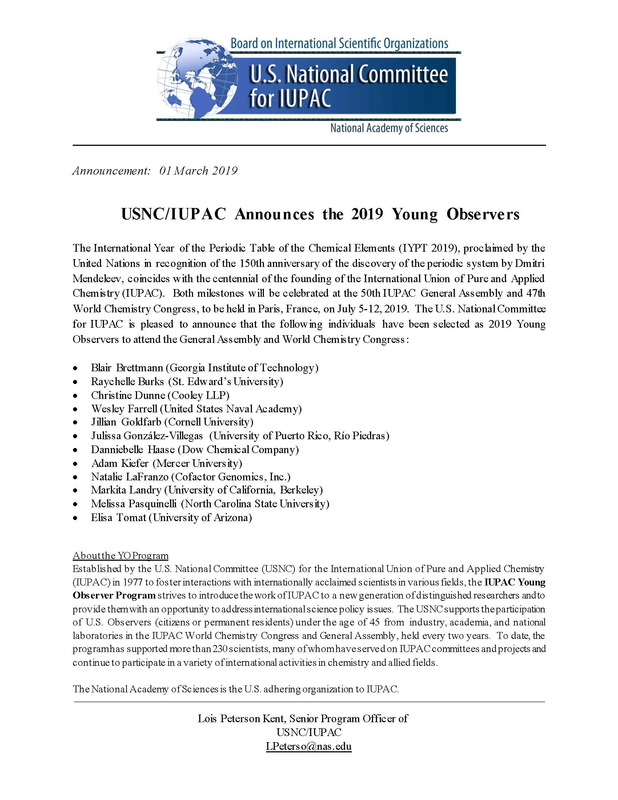 The USNC/IUPAC congratulates this year's twelve Young Observers! Click on the announcement below to learn more about this program. Or visit the Young Observer page. The deadline to submit abstracts for the IUPAC 2019 in Paris, France this July has been extended until April 21! Please visit https://www.iupac2019.org/ for more details. Take the Periodic Table Challenge! In celebration of its centenary (IUPAC100) and the International Year of the Periodic Table in 2019, IUPAC and the International Younger Chemists Network (IYCN) have created a Periodic Table of Younger Chemists. Beginning in July 2018 and ending in July 2019 at the World Chemistry Congress and IUPAC General Assembly, IUPAC is honoring a diverse group of 118 outstanding younger chemists from around the world who in embody the mission and core values of IUPAC. The resulting periodic table will highlight the diversity of careers, creativity, and dedication of the young chemists leading us into the next century. Winners are being profiled on the IUPAC100 website and receive a certificate from IUPAC. Elements of the Periodic Table of Younger Chemists will be revealed over time in order of scientific discovery. In July 2018, IUPAC began revealing approximately eight elements each month. The final elements will be awarded at the IUPAC General Assembly and World Chemistry Congress in Paris, France in July 2019. Nominations are accepted each month for the next set of elements. For more information and to nominate someone, visit https://iupac.org/100/pt-of-chemist. 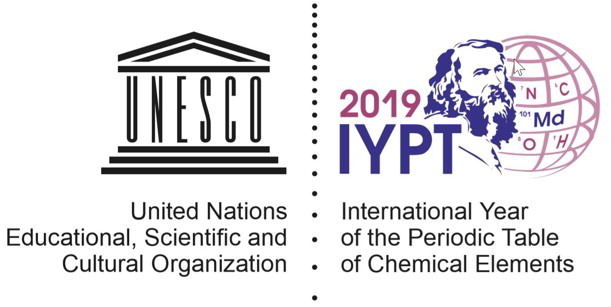 On 20 December 2017, the United Nations (UN) General Assembly proclaimed 2019 to be the International Year of the Periodic Table of Chemical Elements (IYPT 2019). In doing so, the UN has recognized the importance of raising global awareness of how chemistry promotes sustainable development and provides solutions to global challenges in energy, education, agriculture, and health. The development of the Periodic Table of the Elements is one of the most significant achievements in science and a uniting scientific concept, with broad implications in Astronomy, Chemistry, Physics, Biology and other natural sciences. The International Year of the Periodic Table of Chemical Elements in 2019 will coincide with the 150th anniversary of the discovery of the Periodic System by Dmitry Mendeleev in 1869, and with the centenary of IUPAC (IUPAC100). More information can be found on the website https://www.iypt2019.org/. The International Younger Chemists Network (IYCN) was officially launched at the 49th IUPAC General Assembly in São Paulo, Brazil, in July 2017. The IYCN wants to “create a unified global network of young chemists to communicate, collaborate, educate, and mentor”. To find out more, read more in ChemViews Magazine. (online 5 Dec 2017). 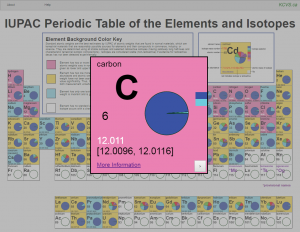 In partnership with researchers at the King’s Centre for Visualization in Science, a team of IUPAC scientists and educators created an interactive electronic isotopic periodic table. Launched in August 2016, it can be found at www.isotopesmatter.com. The accompanying educational materials inform students and the general public about the many uses of isotopes in our lives. A print version of the periodic table of the isotopes and elements is available at http://ciaaw.org/periodic-table-isotopes.htm. Become an IUPAC Affiliate (Individual) Member! Chemistry International is the newsmagazine of IUPAC. For more information. This material is based upon work supported by the National Science Foundation under Grant Number 1708170. Any opinions, findings, and conclusions or recommendations expressed in this material are those of the author(s) and do not necessarily reflect the views of the National Science Foundation.